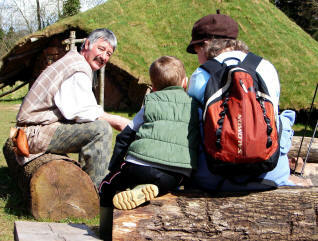 Cinderbury is a recreated Iron Age village situated on the site of pre Roman open cast iron ore mines known as scowles. Just a few hundred metres away is a Romano British villa under the soil. The Cinderbury village consists of three roundhouses as well as a fourth under construction in 2006 and a collection of recreated Iron Age buildings. The whole village is enclosed in embanked and fenced defences with impressive gates. The village is surrounded by woodland at the top of a hill and is invisible from the road. Cinderbury is a visitor attraction catering for day visitors and school and social groups. 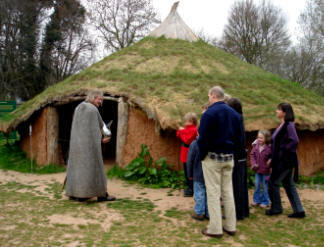 We aim to provide living history experiences and fascinating information for our visitors so that they can experience a taste of Iron Age living from over 2000 years ago. We are also unique in offering Cinderbury Experience holidays where you can come and live in a round house for a weekend or a whole week. At Cinderbury you can explore the fascinating scowles walks through our SSSI woodland, visit the Iron Age farm animal collection and browse our range of Iron Age books and other gifts and souvenirs in our shop. We sometimes run special events and activities so take a look at our Events, Holidays and Courses pages. You can also hire Cinderbury for special events such as weddings and birthday parties as well as corporate hospitality click on Venue hire for more details.